342 pages | 20 Color Illus. | 177 B/W Illus. Modern cancer treatment relies on Monte Carlo simulations to help radiotherapists and clinical physicists better understand and compute radiation dose from imaging devices as well as exploit four-dimensional imaging data. With Monte Carlo-based treatment planning tools now available from commercial vendors, a complete transition to Monte Carlo-based dose calculation methods in radiotherapy could likely take place in the next decade. 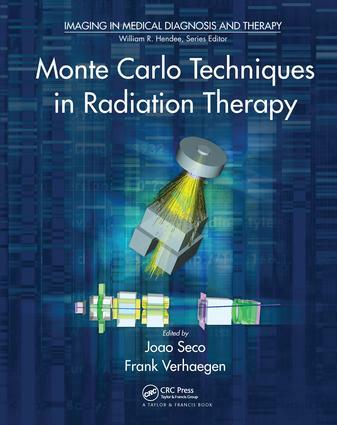 Monte Carlo Techniques in Radiation Therapy explores the use of Monte Carlo methods for modeling various features of internal and external radiation sources, including light ion beams. The book—the first of its kind—world examples, it illustrates the use of Monte Carlo modeling and simulations in dose calculation, beam delivery, kilovoltage and megavoltage imaging, proton radiography, device design, and much more. "The editors are to be congratulated on planning this volume, selecting the many expert authors and editing the vast amount of work the product entails. Every radiation therapy physics department should have a copy of this volume. If they do not, they should purchase a copy, immediately. Keen students around the globe may also want to purchase their own copy, especially if they are taking any medical physics master’s courses." "This is a comprehensive overview of the theoretical and practical aspects of Monte Carlo simulation as applied to therapeutic medical physics. The reference list at the end of each chapter is extremely useful for further reading and study. Chapters are well written by recognized experts in their respective fields. The book is a good addition to the literature and an excellent reference for the medical physics community. Weighted numerical score: 92 - 4 stars." "This is the first textbook targeted at medical physicists that provides not only explanations of the fundamentals of MC methodology, but also reviews the application of this calculation methodology in a variety of RT fields. … This textbook and the foundation chapters in particular should be considered an essential resource for any student or practitioner of MC techniques in RT." Joao Seco is an assistant professor of radiation oncology at Harvard Medical School and Massachusetts General Hospital. He earned his PhD from the Institute of Cancer Research, University of London. His research interests range from proton imaging and therapy to photon beam modeling Monte Carlo, electronic portal imaging, and 4D Monte Carlo proton and photon dosimetry. Frank Verhaegen is head of clinical physics research at the Maastro Clinic. He also holds a professorship at the University of Maastricht. Dr. Verhaegen is a fellow of the Institute of Physics and Engineering in Medicine and the Institute of Physics. He earned his PhD from the University of Ghent. His research interests include imaging and dosimetry for photon and electron therapy, brachytherapy, particle therapy, and small animal radiotherapy.